Myself and my sister Rianne have a very good relationship. She's just a bit odd and harder and incredibly sweet. Our sisters band goes even further than those of my best friends, we have enough words. From birth we have already interacted and have had a great deal of experience with each other. In honor of our tire I designed the 'sister jewelry' collection with sisters bracelets, sisters necklaces and special gift boxes. Because sisters are always there! How sweet, a .925 silver chain for big sister and little sister. The beautiful inscription for the oldest sister is'big sister' and for the youngest sister 'little sister'. A wonderful personal gift. How sweet, a .925 silver chain for sisters. The beautiful inscription of the little sister is' Lil Sis' and the big sister has the text 'Big Sis'. A wonderful personal gift. What is a sweet .925 silver chain this. 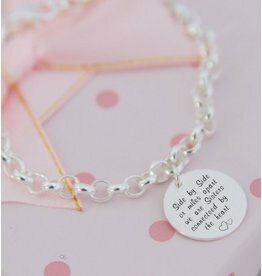 With an engraved charm 'for the little sisters. The sister band is to cherish. Because you're old or young, sisters love ... that's forever! That's why almost all sisters are available in both children's and ladies's sizes! Be proud of these sisters bracelets and chains and show that you belong together. Symbolize this beautiful saying with a beautiful sister jewelry, one for you, one for her. This confirms your special band, it is being taken in a piece of jewelry. For example, you can think of a leak day when you see the bracelet or chain. This message is on the greeting card of many of our greeting cards. Whats up, the sisters band, there are no friends in this regard. 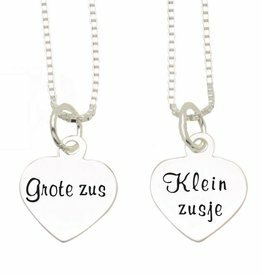 The inspiration sources of this jewelry line are my own daughters Sanne and Kaya, beautifully photographed on this background ... so a proud mother;). 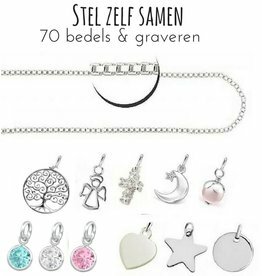 All jewelry are sterling silver and have an extension chain, so it can be worn for many years and remains beautiful forever.